It's that time of year again, and we are gearing up for a comeback year after a highly lack-luster 2013 season. Come and join us at our annual Beer Blast event. The Southside Club has graciously invited us back for another fun day of food, drinks and fun. We welcome back the music of 12 Pack Jack and can't wait to kick off the 2014 season. See you there! One of our favorite events of the year is Oinktoberfest. It's right in our back yard. We don't have to figure out where the nearest grocery store is, and if we forget something we can run home and pick it up. Things are easy, and we're surrounded by lots of friendly BBQ folk. From the new teams to the long time veterans, Oinktobefest is a perfect depiction of what BBQ in Western New York is like. In a whirlwind of events this summer, the Meatheads have hit some all-time highs. Our first win in Chicken, coupled with our First KCBS Grand Champion Call, followed by our 3rd Reserve Grand Champion in 2 years, we've been riding high all season. The 2012 BBQ season brought us into Brockport with our heads held high, and ready for a weekend of fun in the sun at Northampton Park. With plenty of room and grass we camped out with several Western New York teams and had a great time, as we moved through the competitions. The NEBS competition featured the standard 4 categories with additional categories for Ribs and Chili. A 2nd place showing in the Rib-Off had us feeling pretty confident about ribs for Sunday, and showing 4th Overall in the NEBS categories left us feeling pretty good. 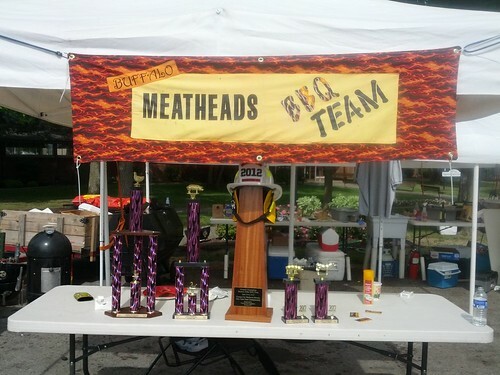 The Meatheads spent the last 2 weekends in some very tough competitions at local events in Wilson and Boston Hills. For a local team, it's important to be a part of all the action in the area, where we get to see friends from around the nearby areas. 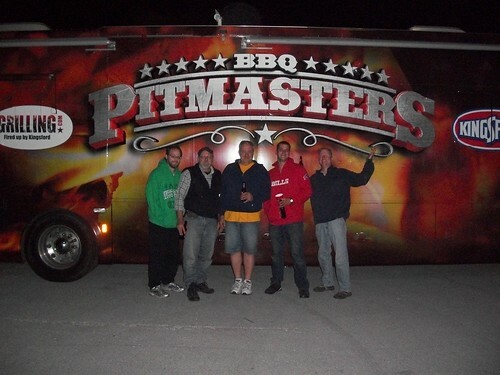 But not only is it important to us to represent our home-town on a big-time scale, we relish the opportunity to compete against some of the most renowned and skilled teams in the barbeque world. After a storied year in 2011, the Buffalo Meatheads were excited to kick off this season with some quality results. Our first competition was at the annual Roc City Rib Fest. And the Meatheads did not disappoint. Nothing beats good weather, good scenery and good barbeque sauce. The guys from Good Smoke BBQ run a great event. Thanks to Brian, John, Josh and the rest of the crew for making Roc City one of the best events we attend all year.